Just to reinforce how quickly the Singaporean economy has grown, here’s a graph showing GDP per capita since independence in US dollars taking into account inflation and the cost of living. 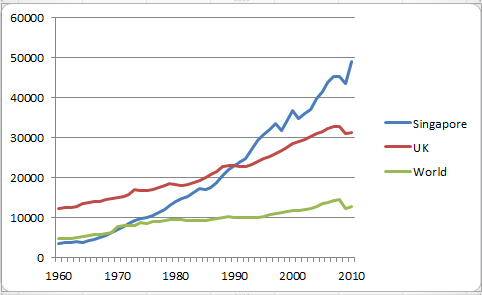 According to these figures Singapore started out as poorer than the world average and overtook Britain in about 1990. The Asian crisis in the late 1990s had a temporary impact, as did the 2008 global financial crisis, but immediately after both these dips the economy resumed its onward march. The steepest part of the whole graph, incredibly, looks like it’s been in the past few years. It’s as if the economy immediately makes up lost ground after each downturn. The right-wing Heritage Foundation, an American think-tank, routinely ranks Singapore as one of the ‘most free’ economies in the world, meaning that public spending appears very low at about 20% of GDP. But this is a superficial reading of the data. If you delve beneath the surface at all, you discover that most land is government-owned and that income from leases go into government coffers. What’s more, super-expensive certificates of entitlement for cars add to government revenues, as do high alcohol and cigarette taxes. A forced savings scheme, the central provident fund, means that government has a ready pool of cash to call upon at cheap rates, and that it doesn’t have to rely so much on the international debt markets. Some commentators have even estimated that public revenues have been as high as 38.5% of GDP, amongst the highest in the world. The former president, Devan Nair, wrote a book called Socialism That Works: The Singapore Way. In his book A Socialist Economy that Works, the first finance minister wrote: “Taking an overall view of Singapore’s economic policy, we can see how radically it differed from the laissez-faire policies of the colonial era”. If you actually live in the country you soon discover that not much about the economy is ‘free’, whatever that means. Government linked corporations account for up to half of GDP, and the opaque political system means that Ministers can direct these corporations toward desired strategic areas. Worth thinking about, in today’s climate of austerity and attempts to shrink government. Brunei economic progress | Brunei top personal travel N gaming guides.